It helps to have a sense of humor in any line of work. Another mural seen in the children's ward by a series of offices, presumably where counseling occurred. 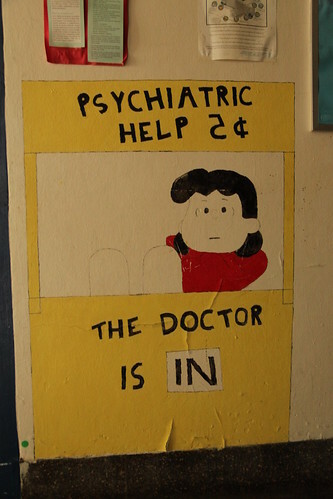 The choice of Lucy van Pelt from Peanuts in her Psychiatric Booth is also interesting in the context of how these doctors viewed their role as pediatric psychiatrists. After all, Lucy van Pelt was an antagonist in Peanuts and would often insult and belittle Charlie Brown during their sessions. Hopefully that is not what they were getting at here.